I wasn’t even in the market for a new mirror, but I just love the shape of this one. It mimics the lines of the cabinet pulls (which were originally in another bathroom, but I spray painted them black and moved them in here). When I bought the mirror that is in there now, we didn’t have a Lowe’s. We technically still don’t: they are building the first one in our city and I drive by way more often than is normal, checking to see if it is open yet. What do you think? Would it work or is it to matchy-matchy? Have I become too fascinated with mirrors? OH you totally have to get it! I saw their post today too and fell in love as well!! 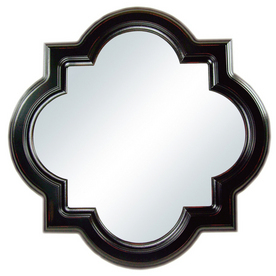 I love the mirror you already have but this one just oozes style. I would go for it!! Thanks Gina! I'm going to check it out as soon as our Lowe's opens it doors. Well, that might be a mob scene. Maybe a week after? Alas, this mirror was too large for the space. Bah. But I am going to keep my eye out for something similar . . .